PRECIOSA Lighting with its 300 years of history is a traditional Czech glass and chandelier manufacturer that today has shifted mainly to contemporary designs. In terms of the image associated with chandeliers, the company focus is no longer on symbols of sovereignty and glory, but on reinterpretations that touch and inspire people on an emotional level. 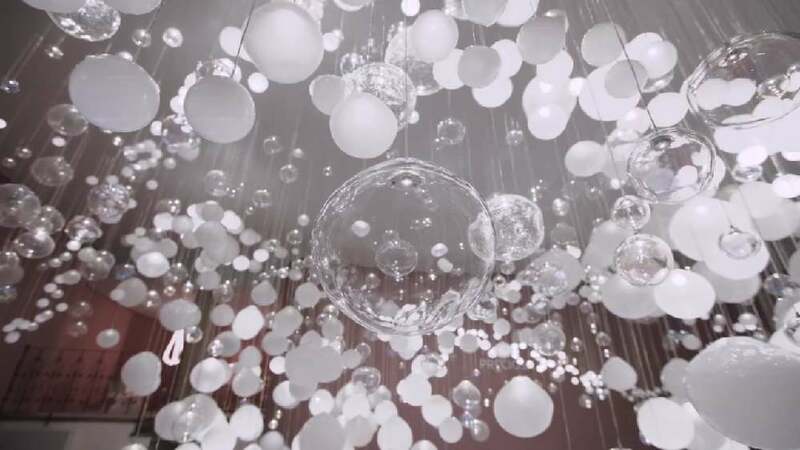 Exuding the appearance of a spatial sculpture, “Breath of Light” is a playful light installation comprising 1,200 handmade crystal spheres of different sizes that have been inspired by soap bubbles and are hung from the ceiling at different heights. The underlying idea was to create an interaction happening not only between one person and the object, but – via the object – between several people. For the first time presented at the Fuorisalone during the Milan Design Week 2018, visitors were invited to blow into the installation at four defined points and thus, with the length of their breaths, trigger light and sound streaming through and enlightening the entire installation. By blowing in simultaneously from different positions, the light streams hit each other at different points and burst just like soap bubbles do. The light installation “Breath of Light” inspires with the lightness and poetry emanating from it. Invited to freely interact from different positions with one another via the installation, visitors could literally breathe life into the installation, making it produce a shining light accompanied by sound. This interaction is not only outstanding in playfulness and aesthetic appeal. The idea of having the light spheres “burst” like bubbles also made the emotional and the material converge into singularity.